Spring is here! The best time of the year, especially if you live in London, because the city comes back to life, literally, lots of flowers everywhere, new leaves on the trees, birds singing, sun, lovely days! Wow! I love London in the Spring! 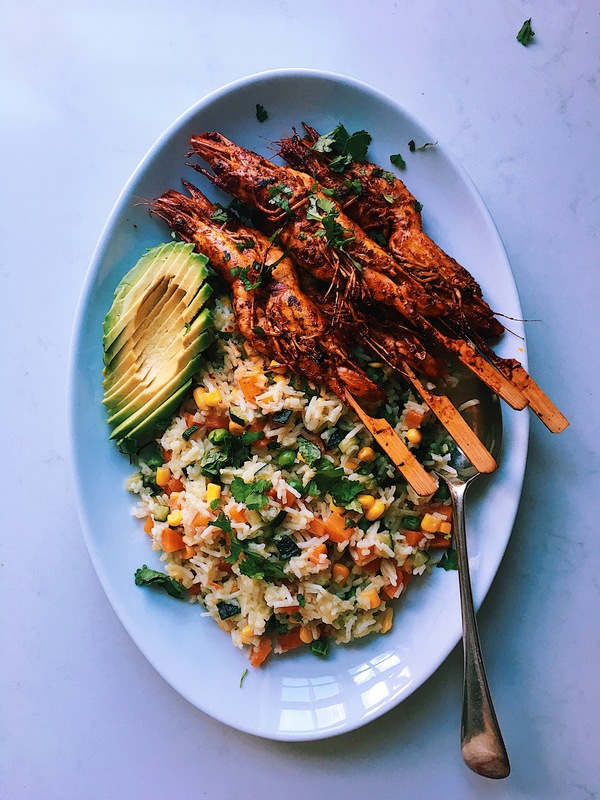 p style=”text-align: justify;”>So today to celebrate the first day of spring I cooked a special dish, Spring rice (arroz primavera) with some delicious prawns marinated in achiote paste and then grilled, believe me, you are going to love this recipe, it is a perfect dish to just serve on a big platter and put it on the middle of the table and let everybody help themselves. Here is the recipe, if you try it let me know what you think, just leave a comment! I will be very happy to read it and replay to you. If you are using wooden skewers, live them to soak in water for a few hours before using them. Then once you are ready to cook, place two prawns in each skewer. Put the prawns to marinate 2 hrs before cooking and store them in the fridge. Chop all the vegetables and have them ready for your rice. Have the chicken or vegetable stock ready. In a large saucepan heat the oil at medium heat and add the onion, after 3 min, add the garlic. Fry them for 3 more min and add the rice, stir for a minute and add the carrots and courgette. Add the knob of butter, once it is dissolved, pour the stock. Low the heat all the way down, add the peas and sweetcorn and put the lid on. Leave it to cook until all the stock has evaporated and the rice is fluffy. While the rice is cooking, take a frying pan or skillet and add 2 tbsp of oil. Once is hot add the prawn skewers and fry for 3 min on each side at high heat. 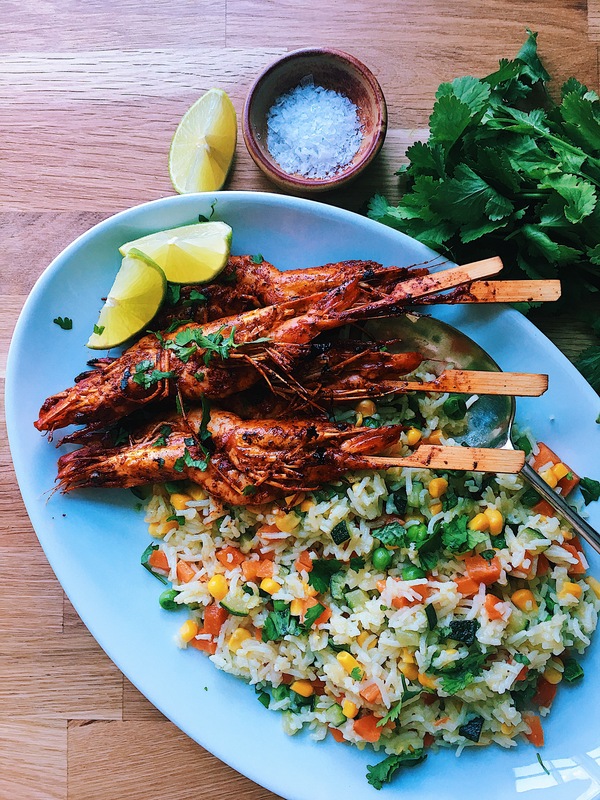 When the rice and prawns are ready, serve them on a big platter and place it in the middle of the table. Add some avocado slices on the side and some lime wedges. Enjoy them in a family gathering with some nice refreshing beers.